Rant: Why can’t Microsoft provide actually useful titles on their updates? Windows Updates have improved dramatically over the last few years. With Windows 7, the integrated updates install smoothly and without much fuss (apart from the occasional EULA or Internet Explorer Upgrade to throw a spanner in the works). There’s just one thing. In general, the update titles are useless. Completely useless. 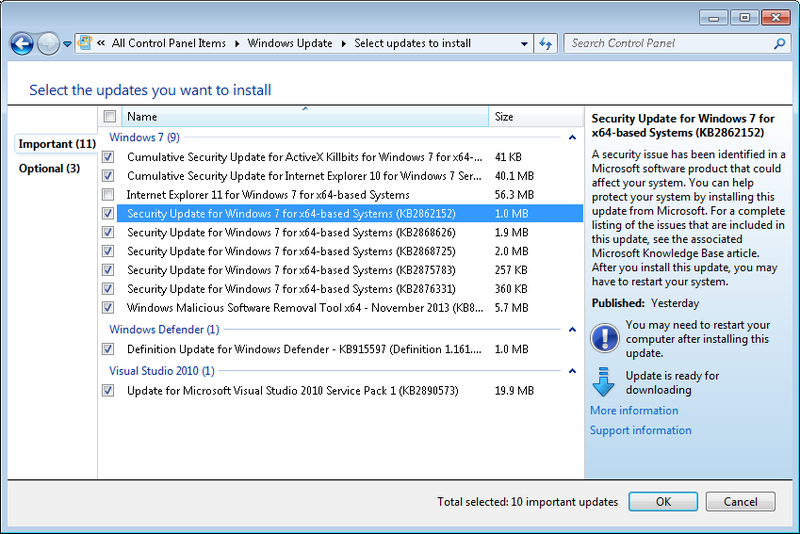 “Security Update for Windows 7”? Why else would I be running Windows Update? We already know it’s for Windows 7 — that’s in the group title. We couldn’t we see “Update for RemoteApp and Desktop Connections features is available for Windows (KB2830477)”, instead? So which sleeve did I pull that descriptive and useful title from? 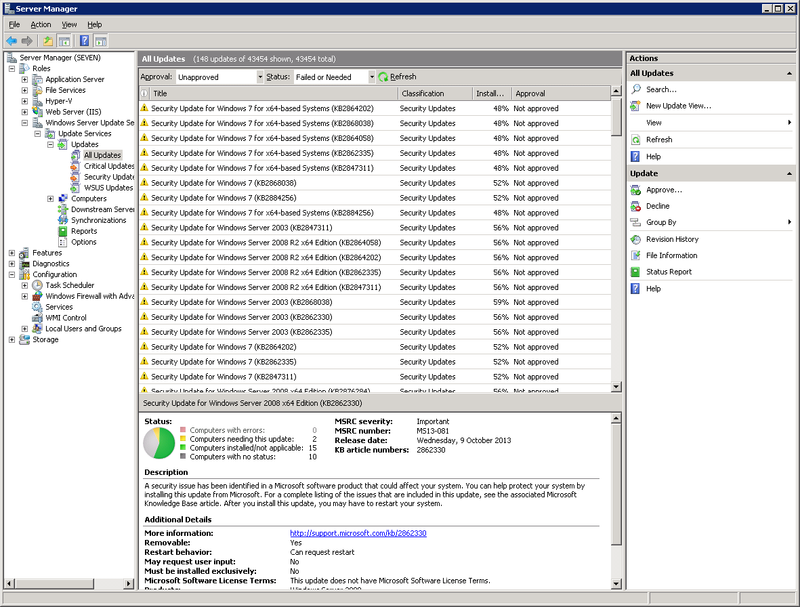 Now it’s even worse when using WSUS — you now have to trawl through hundreds of nearly identically titled updates, with only a KB article number to differentiate. So easy to accidentally approve the wrong update. Why, Microsoft, why? Is it so you don’t scare consumers who don’t understand what the update provides? They just press the big “Automatic Updates” button anyway! But even that could be improved. We’ve got a lot of repeated information: “Visual Studio 2010” is referenced 4 times: in the group title, in the update title, in the update title in the preview pane, and in the description of the update, again in the preview pane! Surely we don’t need to know that 4 times! And why don’t we go with a title of “Update fixes coded UI test issues for Visual Studio 2010 SP1 in IE9 or IE10 when KB 2870699 is installed (KB2890573)”. 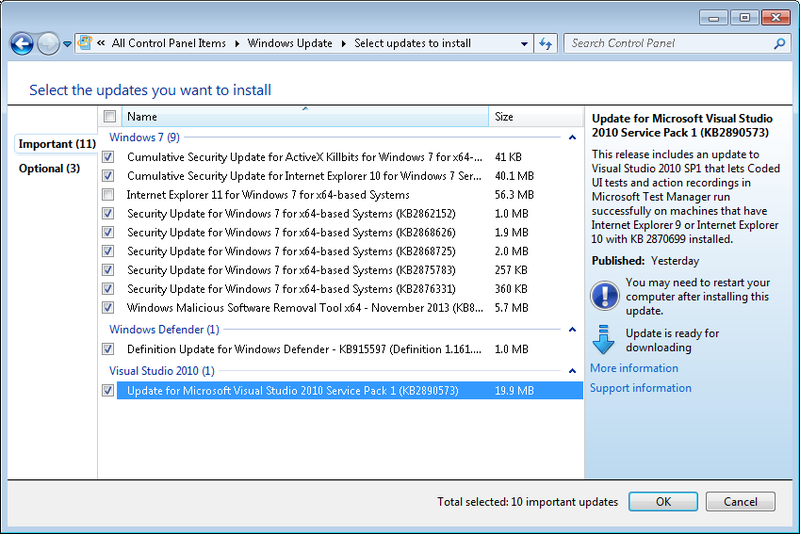 Sure it’s a little bit long, but it’s better than “Update for Microsoft Visual Studio 2010 Service Pack 1 (KB2890573)”. So in conclusion, may I ask you, Microsoft, please, fix these update titles? Just start giving us titles that mean something? And if you are feeling particularly generous, you could even update the description of the update to add more meaning, not less! The very same issue bothers me already for some time. I used one very nice third party software to monitor PC resources and (besides that) installing MS updates remotely when needed. For some time this application provided relevant info, but then it was removed, replaced with above crap. This seems more like a Microsoft policy, rather then a simple flaw in description logic. If someone have any idea what might be behind this, please share with us. Borland is right to be annoyed with the lack of information that MS is providing when it wants the user to modify the OS on HIS or HER computer*. If one does not completely bow down before the the Wizard of Oz (the great and all powerful M$) and therefore does not allow M$ to to automatically install updates, then one is hardly able to (without jumping thru a number of hoops for each patch M$ is providing) find out what each update is about. Not so long ago M$ provided an “executive summary” in the right pane of the update info for those people who wished to be informed about potential updates and they would control which would be applied. Now M$ provides a generic, and worthless, description for all updates. Well, I think I can provide a reasonable answer to Borland’s query. M$ wants complete control and so it makes it as difficult as possible for users to select which updates an individual wants to install. Therefore, encouraging all users to bow before what M$ decides is good for them by surrendering to the auto update. It is fair to ask what would be M$’s motivation for this? Well, it is hardly to M$ credit that it’s operating system has so many security holes that it needs to provide fixes on a monthly basis to deal those vulnerabilities. If Linux had more relevant programs — I know it has a fair number now, but is not quite there yet — I’d opt for that. I’m not quite sure I agree with your conclusions, Simon. I largely agree with Simon#1. I immediately became poed when M$ dropped the executive summaries in the right pane. Previously, I would usually decide on the basis of the summary if I wanted to d/l the update or not. And, speaking of pains, when one goes to the “More Information” link the info is so generic as to be useless. Thus, the only reasonable conclusion is that M$ wants to make the users individual choices on the updates so difficult that everyone will install all of them. Maybe Simon#1 is right about M$’s motivation — maybe their motivation is to protect themselves from a DOS attack (ironic acronym). :^) Who knows? Btw, I did set up an HTPC about a year and a half ago using Linux Mint. I could not link to Netflix streaming and there was not an internet radio program that had more than a dozen or two radio stations in its database. Were it not for these problems I would not have spent over $100 for Windoze. YEP – Better descriptions – Nothing worse then being told it is a critical security update to find it is simply a download Windows 10 nag. CRITICAL SECURITY UPDATE!!!! And this is why MS will not publish better descriptions (gets in the way of sales) MS knows nothing about ethical sales. I miss the days of purchasing an app and being done with the company. Instead these days everyone (especially MS) wants onto your computer daily! There is “kind of” a trade off though – disable all MS updates… Somehow my routers are still tagged regularly from MS 🙂 I miss the computer industry philosophies of Steve Jobs! To be honest, the only way you can afford not to get software updates now is to disconnect yourself from the Internet entirely. Otherwise, your risk of being compromised by malware just continues to increase. And malware these days is getting pretty nasty — in particular ransomware. 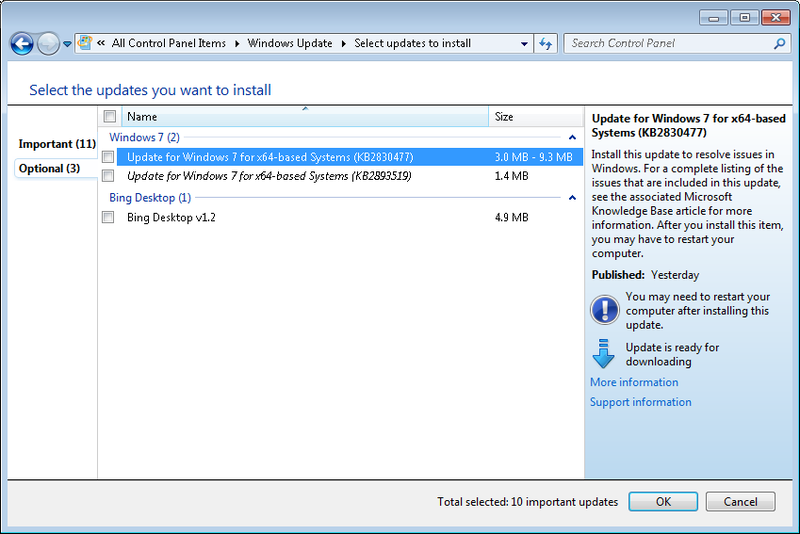 Disabling Microsoft updates entirely ends up being a false safety measure.